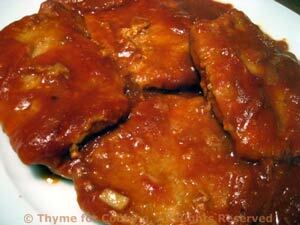 Pork Chops Diablo, a spicy main course, quick, easy gourmet recipes. 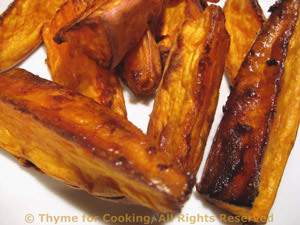 Sweet potatoes are becoming a year 'round staple here and I like to pair their caramel flavor with something spicy. Diablo or deviled usually means spicy, often hot and always full of rich, complex flavors. These zesty pork chops are a perfect example. The ones I get are quite thin. You may need to increase the cooking time if you are using very thick chops. Combine flour and 1 tbs chili powder in plastic food bag. Add pork chops and toss to coat. In nonstick skillet, large enough to hold the chops, heat 2 tsp oil over medium-high heat. Add chops and sauté about 3 minutes per side, until lightly browned. Add remaining 2 tsp oil and the remaining 1 tbs chili powder. Sauté for 1 minute, then add onions. Sauté about 5 minutes until onion starts to brown. Add tomato sauce, broth, Worcestershire, mustard and bring to a boil. Add cornstarch mixture and cook, stirring constantly until thickened. Reduce heat to low and return chops to pan. Cover, and simmer chops until done, about 10 minutes, turning once. Serve chops with sauce and onions. A bit crunchy on the outside from the caramelized sugars; like warm, creamy pudding on the inside.... Wonderful! Slice potatoes in half the short way, then each half into 8 wedges. Put oil into a large bowl, add potatoes and toss, coating thoroughly. If your leek is very clean, leave it whole and slice rounds for a nicer presentation. If sandy, slice in half and rinse as usual. Slice the carrots into thin rounds. Trim leek, cut in half the long way and rinse well. Thinly slice. Heat oil in a small skillet. Add the leeks and sauté until tender. Add the carrots and stir well to combine. 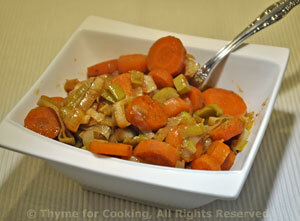 Add the stock, cover, reduce heat and cook until carrots are tender, 12 - 15 minutes.